l-Arginine (Arg) is synthesised from glutamine, glutamate, and proline via the intestinal-renal axis in humans and most other mammals (including pigs, sheep and rats). Arg degradation occurs via multiple pathways that are initiated by arginase, nitric-oxide synthase, Arg:glycine amidinotransferase, and Arg decarboxylase. These pathways produce nitric oxide, polyamines, proline, glutamate, creatine, and agmatine with each having enormous biological importance. Arg is also required for the detoxification of ammonia, which is an extremely toxic substance for the central nervous system. There is compelling evidence that Arg regulates interorgan metabolism of energy substrates and the function of multiple organs. The results of both experimental and clinical studies indicate that Arg is a nutritionally essential amino acid (AA) for spermatogenesis, embryonic survival, fetal and neonatal growth, as well as maintenance of vascular tone and hemodynamics. Moreover, a growing body of evidence clearly indicates that dietary supplementation or intravenous administration of Arg is beneficial in improving reproductive, cardiovascular, pulmonary, renal, gastrointestinal, liver and immune functions, as well as facilitating wound healing, enhancing insulin sensitivity, and maintaining tissue integrity. Additionally, Arg or l-citrulline may provide novel and effective therapies for obesity, diabetes, and the metabolic syndrome. 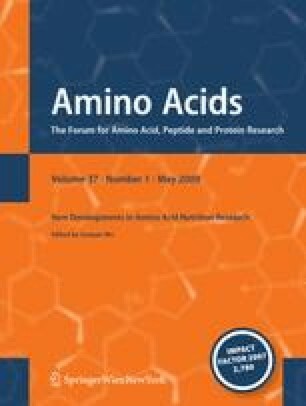 The effect of Arg in treating many developmental and health problems is unique among AAs, and offers great promise for improved health and wellbeing of humans and animals. This work was supported, in part, by grants from National Institutes of Health (1R21 HD049449), National Research Initiative Competitive Grants (2006-35203-17283, 2008-35206-18762, 2008-35206-18764, and 2008-35203-19120) from the USDA Cooperative State Research, Education, and Extension Service, American Heart Association (0655109Y and 0755024Y), Texas AgriLife Research (H-8200), National Natural Science Foundation of China (30371038 and 30528006), and the Outstanding Overseas Chinese Scholars Fund of The Chinese Academy of Sciences (2005-1-4). We thank Drs. Nick Flynn and Nancy Turner for helpful comments on the paper.